The United Kingdom and Italy now have a DigiComics section on their local Disney websites. 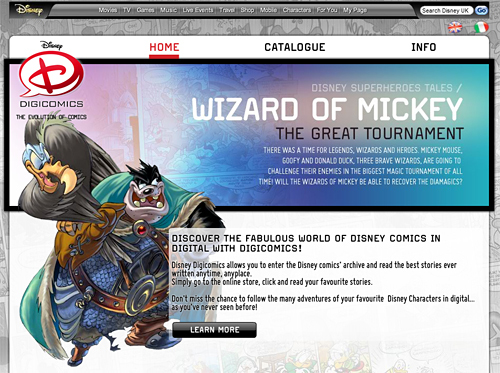 The two sites can be found at disney.co.uk/digicomics and disney.it/digicomics. They are only two pages, but provide some official information about the service. Amazon has another one of their great 4-for-3 deals for books under $10. This includes some of Boom’s latest trade paperbacks as well as lots of older Gladstone and Gemstone comics and albums that are still in stock at Amazon. 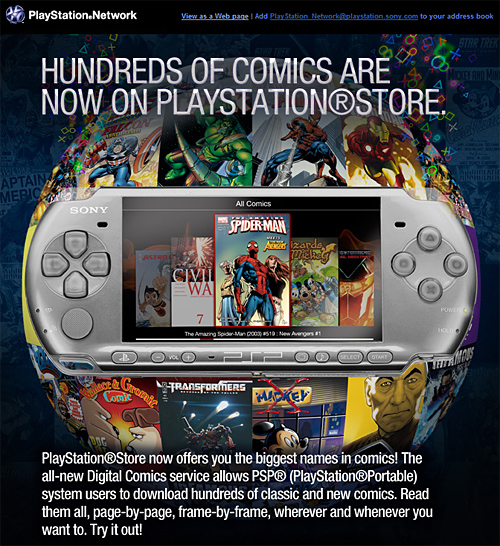 Last Thursday, PlayStation launched their new Digital Comics service for the PSP (PlayStation Portable). Comic stories can be purchased from the PlayStation Store and there’s a large variety of different genres, from Astroboy to X-Men. 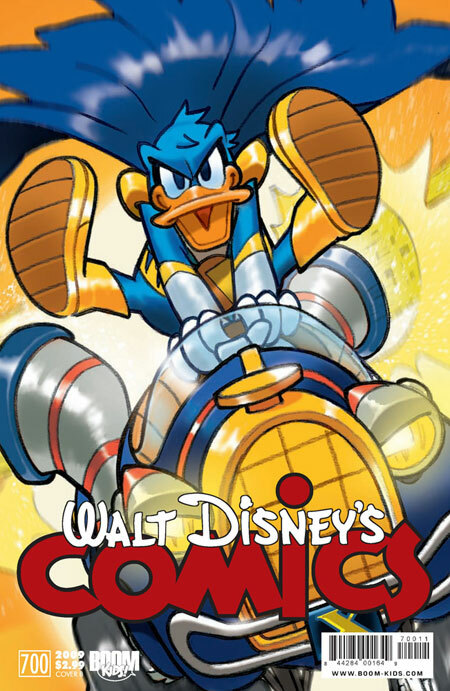 Disney comics are available too (or I wouldn’t be writing about this here) as part of the new Disney DigiComics program from Disney Publishing Worldwide. 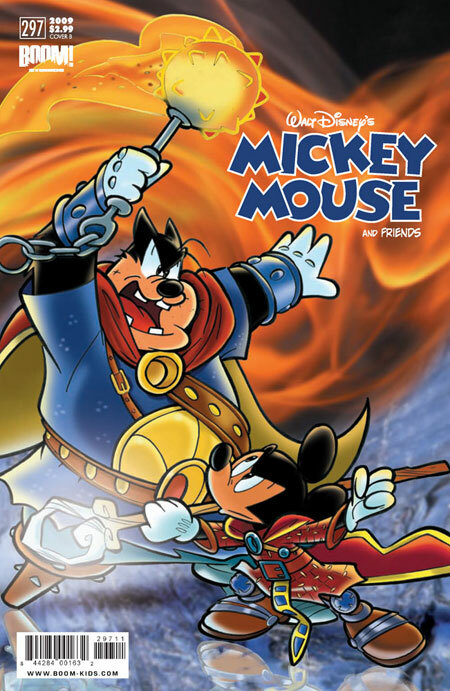 Right now there are a total of 40 Disney comics available for download and DPW plans to add five to ten new stories per week! The PSP service is currently only available in English in Australia, New Zealand, United Kingdom, United States and South Africa. There are also sites for Ireland, Germany, Italy and Spain but these have a ‘coming soon’ message on the homepage. 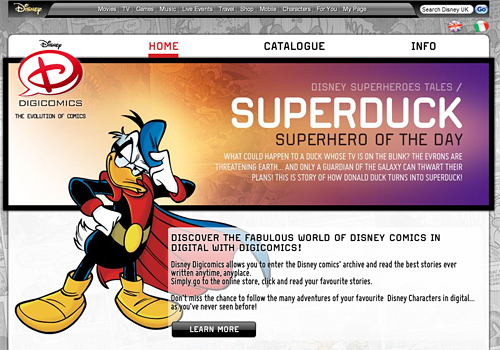 In 2010, other countries will be added and Disney DigiComics will become available on other platforms, like Apple’s iPhone and iPod. 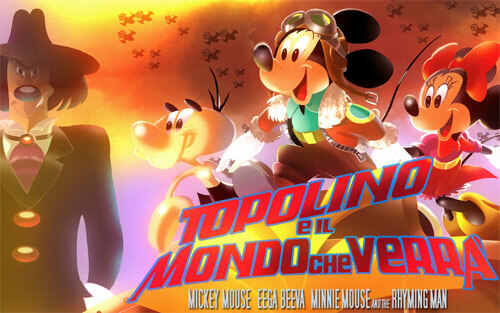 Disney DigiComics is using the vast library of comics created by The Walt Disney Company Italy for Topolino and other Italian comics. 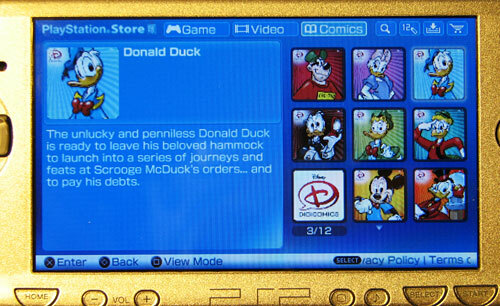 The Disney stories are in a special section in the PlayStation Store on the PSP and they are organized by character. You can browse by Donald Duck, Daisy, Gladstone Gander, etc. Special series, like Double Duck and Wizards of Mickey, are listed separately. The short stories (around 25 to 30 pages) are $0.99 each and the longer ones (around 50 pages) are $1.99. 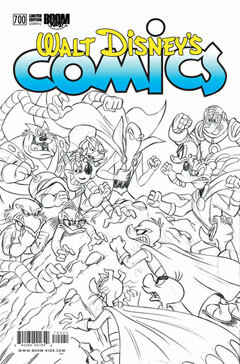 There is one free 8-page comic for download, which is titled ‘Donald Duck and the Fussy Genie’ (I-2270). 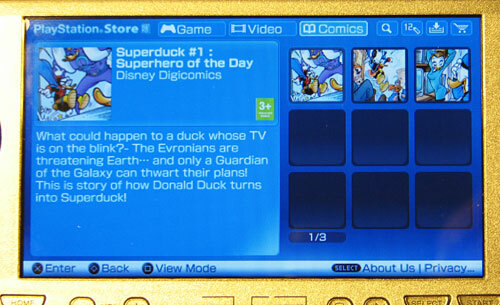 Just a quick note that Disney DigiComics have launched on the PlayStation Network today for the PSP (PlayStation Portable). 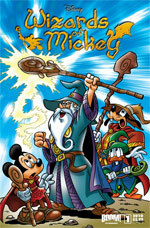 You can view the available Disney comics here. Most of them are $0.99 each, but there seem to be some free ones too. I received the following email in my inbox this morning. 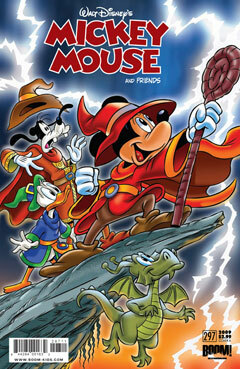 Check it out, there’s pictures of Wizards of Mickey and X Mickey in there! Sony’s comics website is available in the following countries: Australia, Germany, Spain, France, Ireland, Italy, New Zealand, Austria, South Africa, United Kingdom and the USA. I haven’t tested yet if Disney comics are available in each country, but this is quite a big launch. 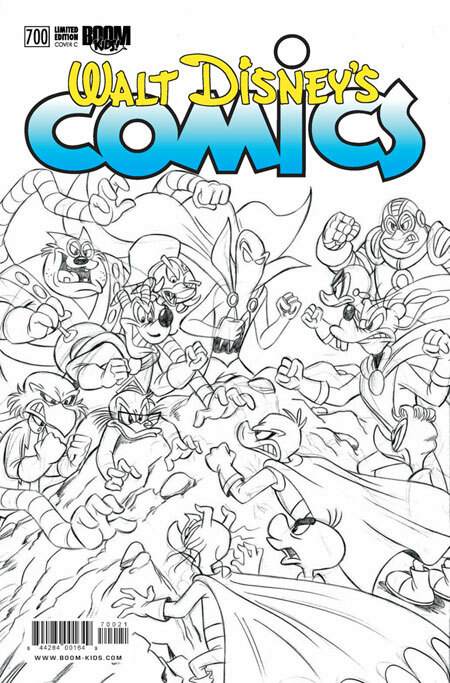 Looking for Christmas gifts for the comic or Disney fan on your list? Here are some of my top Disney comics gift ideas. It’s a mix of goodies for collectors, new comic readers and the littlest Disney fans, too! This 112-page hardcover book by Boom! Kids features some great Disney comic holiday classics written and drawn by creators who are legends in the field. 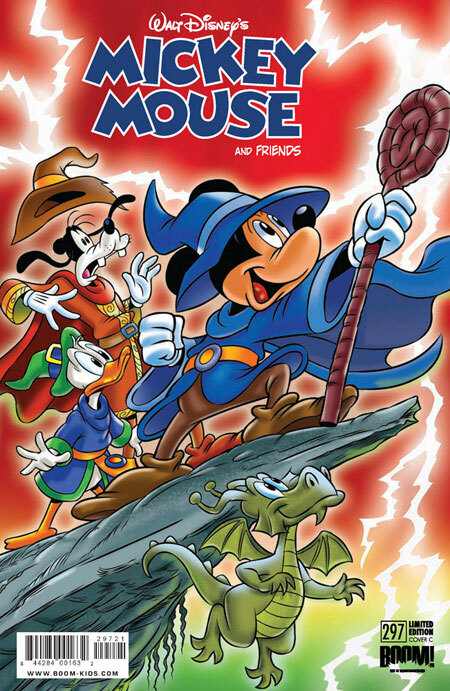 This great 160-page paperback by Gemstone Publishing celebrates 75 years of Disney comics (it came out in 2006). Travel from the Mickey Mouse epics of Floyd Gottfredson and Paul Murry to the long Donald Duck and Uncle Scrooge adventures of Carl Barks and Don Rosa. This book is the only comprehensive collection of Carl Barks interviews. It ranges chronologically from the very first one to the artist’s final conversations with Donald Ault in the summer of 2000. “Conversations” reveals previously unknown information about the life, times, and opinions of one of the master storytellers of the twentieth century. This paperback has the first four chapters of Boom! Studio’s new The Incredibles comic book. America’s favorite family of superheroes finally returns, courtesy of legendary comics scribe Mark Waid! The Incredibles face terrifying new villains … and friendly new neighbors, all while Mr. Incredible hides a troubling secret from his costumed clan. Be a beagle boy with this 176-167 numbered t-shirt. 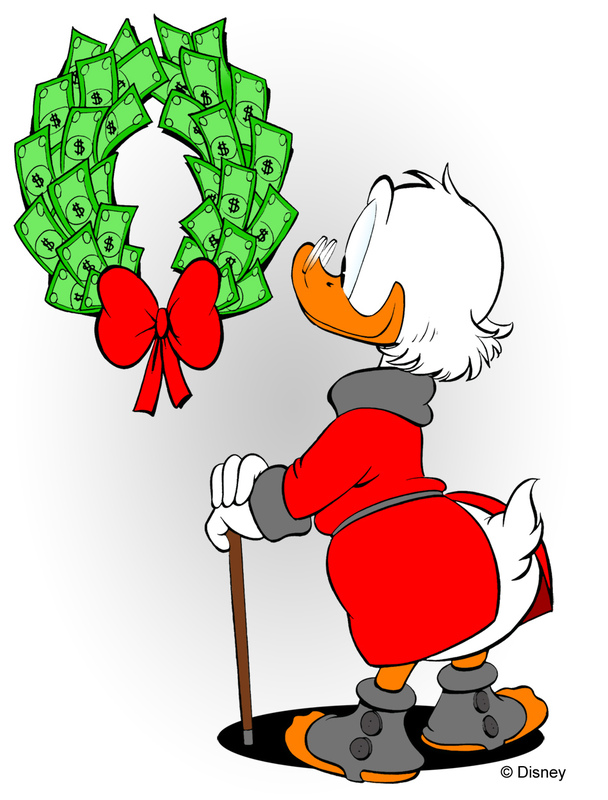 Just be careful for all those booby traps around the money bin when you try to steal some of Scrooge’s money. It can be really dangerous out there! The design is available on different t-shirt styles and apparel items. Disney and Me is a classic children’s favorite. The magazine is published bi-monthly and is targeted at children aged 2-6. Each issue includes stories, drawing, matching, counting, coloring, and a pull out workbook. Magazine subscription available within the US only. This is the fourth in a series of beautiful Syroco-style statues from the new Uncle Scrooge Character series. Magica de Spell, created by Carl Barks, believes that if she could somehow steal Uncle Scrooge’s “number one dime” for herself, it would allow her to use her magic spells to get mountains of riches of her own. Great collector’s item. The quack is back in this new Boom! Kids series. He’s no double ‘o’ seven, he’s Double Duck! Donald shows us his dashing, adventurous side as a secret agent on a mission to stop a dangerous ice-melting machine and save the world from rising oceans! This is a Donald Duck like you’ve never seen! 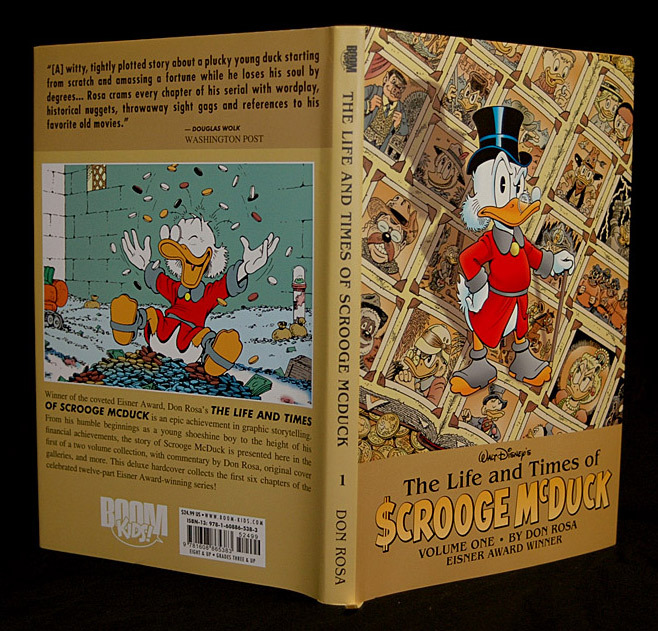 This 208-page book by Gemstone Publishing has the pre-chapters and in-between-chapters of Don Rosa’s famous Life and Times of Scrooge McDuck series. This wonderful trade paperback by Gemstone Publishing is still available. Featuring ‘Hearts of the Yukon’, ‘Prisoner of White Agony Creek’ and more! Barks fans, show your ‘hometown’ allegiance with this exclusive unofficial swag from Calisota University. Calisota is the functional US state from the Carl Barks comics, a combination of the real-life US states of California and Minnesota, that is home to Duckburg. The design is available on various t-shirt styles. See how Lightning McQueen became a Piston Cup sensation in this pulse-pounding collection! CARS: THE ROOKIE reveals McQueen’s scrappy origins as a local short track racer who dreams of the big time…and recklessly plows his way through the competition to get there! Along the way, he meets Mack, who help McQueen catch his lucky break. Andy has a new addition to his roomâ€”a circuit-laden egg. Is this new gizmo a friend or foe? While Woody and Buzz welcome the mysterious stranger, Hamm and Rex are terrified of it, plotting to destroy the orb before Andy comes home! Can they do it? Story by Eisner Award-nominated writer Dan Jolley! Disney’s Princess is an early-learning magazine which brings together Disney favorites. Each issue is full of magical stories, a collectible poster, a Princess project, and a pull-out workbook full of fun activities. It’s published bi-monthly and it’s great for any princess, aged 4 and up. Magazine subscription available within the US only. Boom! Studios recently relaunched this classic Uncle Scrooge monthly comic book series. 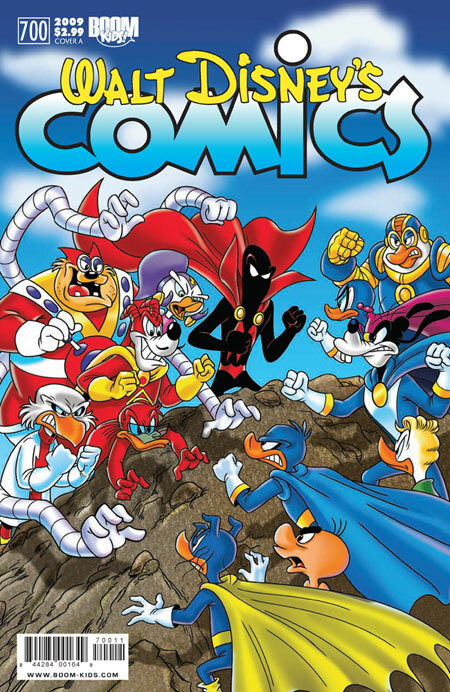 Building on a tradition created by some of the greatest creators the comic book world has ever seen, like Carl Barks and Don Rosa, these issues follow Scrooge on new adventures that North American audiences have never seen! Walt Disney’s Comics & Stories is one of the longest-lived and greatest comics of all time. The new series by Boom! 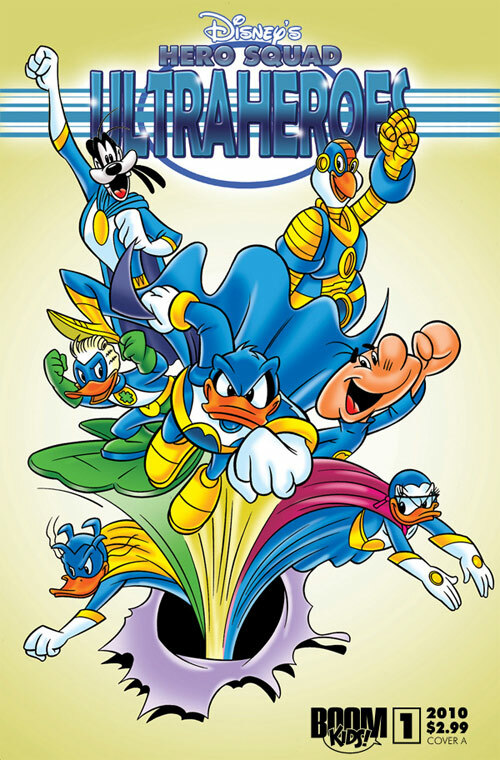 Studios kicks off with an Italian multi-part series titled Ultraheroes, which features all the superheroes of the Disney comics universe in an epic clash against the super villains to determine the faith of the world. In September Boom! Kids launched this new series featuring adventures starring Mickey Mouse and friends. The series kicks off with Wizards of Mickey, an epic story with Mickey, Donald and Goofy in a world of wizards, castles and bewitched lands. Don’t you just love the square eggs from the valley of Plain Awful? Next time you go get some, make sure you don’t bring any round things with you. This great design for Barks fans and collectors of Disney comics is available on different t-shirt styles. This 2006 book from Gemstone Publishing collects vintage Carl Barks Uncle Scrooge stories that DuckTales adapted to animation. The second volume includes such classic stories as “Giant Robot Robbers,” “The Golden Fleecing,” “The Horseradish Story,” “The Status Seeker,” “Tralla-La” and more! 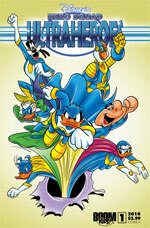 This is the first of three DVD volumes collecting all the DuckTales animated TV show cartoons. The 3-disc box set featured 27 fun episodes, including Send in the Clones, Where No Duck Has Gone Before, Robot Robbers, Microducks From Outer Space and more. Join Tinker Bell and her fairy friends from Pixie Hollow in this sparkling magazine. Every issue includes stories to read, an activity workbook, craft projects, collectible fairy profiles and great giveaways. Tinker Bell Magazine is for young girls who love everything about fairies. Published 6 times per year. Magazine subscription available within the US only.